Eradicating hunger is one of the oldest challenges facing humankind, and it is now a key feature of the 2030 Sustainable Development Goal (SDG) agenda. Moreover, global environmental change, social vulnerabilities and increasing hazard events impact global food security in a major way, thereby merging all SDGs into one sole complex reality of undecipherable causal relations and feedbacks. 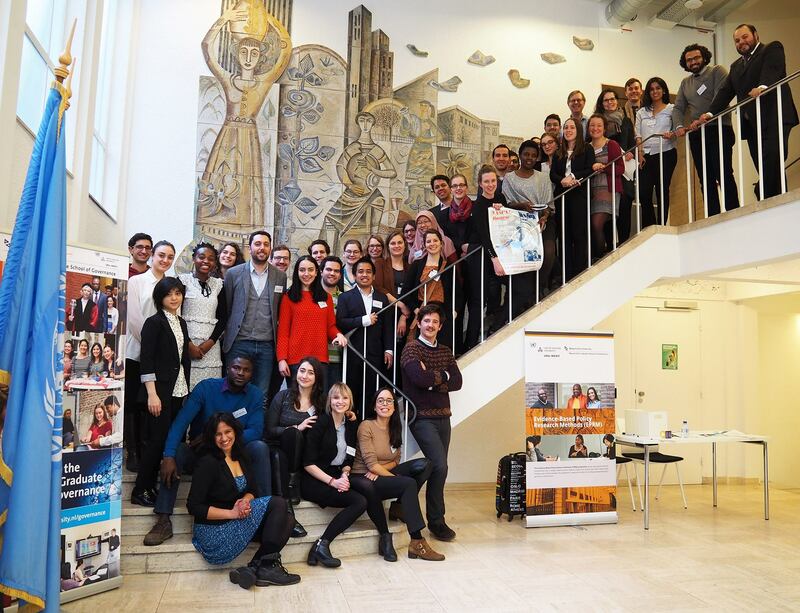 Given this, initiatives aimed at alleviating hunger need to be designed and conducted in an inter- and transdisciplinary manner, and this served as the main objective of this year’s NASPAA student simulation competition, held in Maastricht, home of UNU-MERIT. Graduate students from leading schools around the world, including UNU-EHS, came together to design models geared towards achieving Sustainable Development Goal (SDG) Number 2, namely to ‘End hunger, achieve food security and improved nutrition, and promote sustainable agriculture’. Embracing the transdisciplinary model, the NASPAA organizing committee chose this year to rule that all teams in the competition needed to be made up of one specialist agriculture, health and environment officer per assigned region, all three of which were coordinated by a Regional Director. Working together from their different areas of expertise, the regional teams were asked to recommend and fund projects which had varying impacts on selected food security indicators. The simulation program would then run the model based on the decisions made by the participants and move the scenario three years forward for another round of data analysis and project planning. The simulation ended in the year 2030, coinciding with the end of the SDGs agenda. The modeling software also displayed major environmental events happening in each region’s simulated future. South America, for instance, suffered from major droughts due to El Niño in the years 2019 and 2023. In East Asia, the regional team had to deal with a severe typhoon at the start of the 2020s. In cases like these, most of the overall budget for food security projects had to be assigned to emergency response and recovery, thus affecting the continuity of the projects set for the entire period – just like in real life. However, is this the only way to deal with crises? 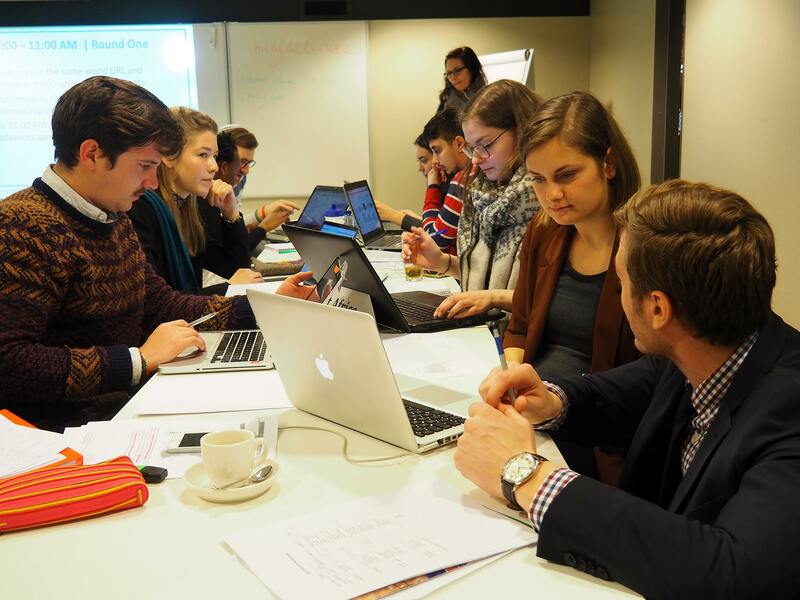 The students from UNU-EHS have learned that there is no such objective dichotomy between “normal times” and disasters. People’s vulnerability to natural hazards and stressors is the accumulation of a day-to-day construction built upon historical root causes acted on by structural and current conditions all on the interplay of political, economical, social, cultural, physical and institutional dimensions (Wisner et al, 2004; Birkmann et al, 2013). Relying solely on immediate reactions to disasters is an ineffective and costly strategy, as well as a deeply demoralizing one. Integrating holistic Disaster Risk Reduction (DRR) measures into strategic Food Security planning is, therefore, a smart move. By concentrating on reducing the vulnerability of those most at risk – as opposed to investing solely in projects aimed at increasing production – it becomes more likely that no one is left behind. Furthermore, in the face of global environmental change, investing in projects for climate change adaptation and sustainable use of resources is a prerequisite for any real transformative path away from our ‘business-as-usual’ approach. Working in teams with graduate students drawn mainly public policy and administration studies programs, the six students from the Masters in “Geography of Environmental Risks and Human Security” representing UNU-EHS at the competition were able to bring in a different view to the problems at hand. The benefits of an interdisciplinary approach were manifest as the whole UNU-EHS student delegation was part of the winning team for the regional competition and later on congratulated at the international phase of the competition for the strategy presented for carrying out the simulated policies.